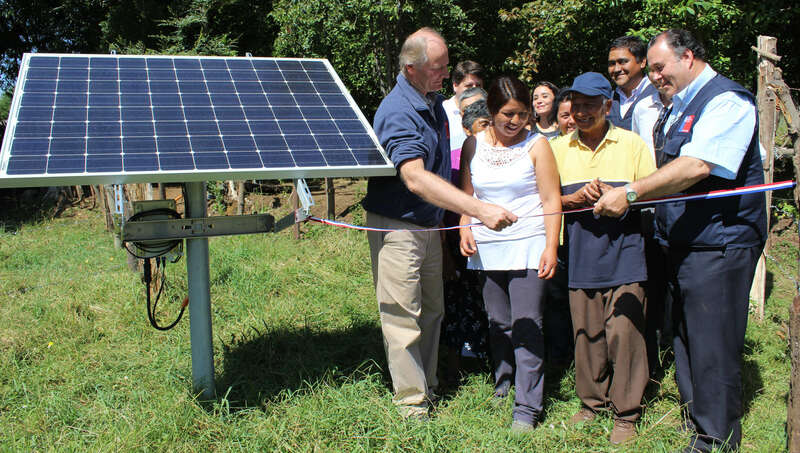 World Technology supplies solar off-grid systems for agricultural water pumps in remote areas of Northern Chile. Go to page: World Technology supplies solar off-grid systems for agricultural water pumps in remote areas of Northern Chile. INDAP Selects US made IronRidge Pole Mounts for 3,000 Solar off-grid systems for agricultural water pumps in remote desert areas of Northern Chile. New York, New York. – April 13, 2013 – World Technology Corporation (World Tech), a preferred supplier of capital equipment for commercial and utility-scale solar systems, announced today that its US made IronRidge solar pole racking system was selected by INDAP – Instituto De Desarrollo Agropecuario, Chile’s Ministry of Agriculture for the supply of 3,000 solar off-grid systems for agricultural water pumps in remote desert areas of Northern Chile. “While there are more droughts, the more water I have. With this project of photovoltaic panels I am happy because I can irrigate more area all day at no cost, only the energy of sunlight that does not pollute,” sums up the farmer, Mercedes Coña, who has incorporated this new technology for a vegetable production farm in the municipality of Nueva Imperial. For Mayor Juan Delgado of Neuva Impetrial: “These technologies generate a large impact on agriculture and are very appropriate, because in the months of summer there is a high radiation to take this solar energy. We are seeing a solution to the issue of drought not only for Padre Las Casas but for the entire region. ” The photovoltaic system includes the installation of a solar panel and a submersible electric pump, which improved flow rates of 0.5 to 1 liters per second up to 40 meters high, and can irrigate a total area of 3,000 square meters. Click here to to watch a video on the project. IronRidge designs and manufactures structural hardware for residential and commercial solar systems. For nearly 20 years, IronRidge has worked closely with solar professionals across the globe to build products that are strong, simple and cost-effective. Tamarack Solar Pole Mounts are designed to install quickly and provide a secure mounting structure for PV modules on a single pole. The intuitive design is easy to learn and provides for a fast and easy installation. Using heavy-duty corrosion-resistant 5052-H32 aluminum components, both the top of pole and side of pole mounts are built to last. With several different model sizes, the Tamarack Solar pole mounts can hold up to 4 standard sized PV modules. In addition, seasonal adjustability for maximizing energy production is provided by several tilt-angle settings and can be operated by a single individual. World Technology is an innovative export management company that handles the exports for several leading US solar equipment manufacturers. We are experts on developing and supporting international markets for photovoltaic equipment. Headquartered in New York, our multi-lingual sales executives support customers in over 45 countries. We are not a distributor, we offer high quality solar products and full design and logistics support at pricing lower than buying direct from the manufacturer. We join President Obama in supporing the National Export Initiative, helping US companies become more competitive around the globe. World Technology Corporation wins technology sector for the U.S.. Small Business Administration Export Program. Copyright © 2016 World Technology Corporation. All rights reserved.